New Fryer? Nope. Just Clean! 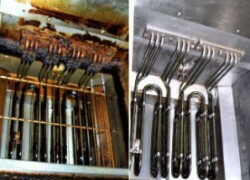 A Food service company in Missouri used Alconox for the first time to clean their kitchen’s deep fryer. 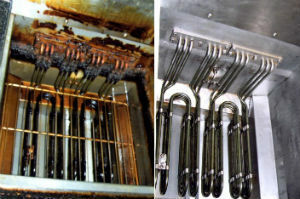 Cleaning a fryer with Alconox is simple. First, drain the fryer and refill with water. Add 1lb. of Alconox concentrated detergent to the water and stir to dissolve. If the fryer has a “Boil Out” or “Simmer” setting, use that. If not, set the fryer to 190 deg F. Drain the detergent solution from the fryer, rinse with fresh water, and dry completely. This particular food service provider’s fryer looked so new that, upon seeing it, employees thought the company had bought a new one. They also put the baskets and other fry tools in the Alconox solution to get them shining. But a clean, like-new fryer is not just easy on the eyes. To learn more about How to Clean your food prep equipment, Cleaning Principles and other information, visit http://alconoxfoodservice.com. To receive a free sample of Alconox, Inc. detergent, like Alconox, please complete the form here at Get A Sample. Or ask our cleaning experts a technical cleaning question at Ask Alconox.